We run a series of training courses throughout the year in order to assists those responsible for asbestos management planning as well as contractors involved in its removal. 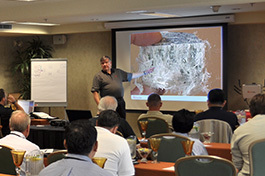 These courses give us the opportunity to share our expert knowledge of the issues with your teams so you can be sure you are fully compliant with regulations required by law for working with asbestos-containing materials. Details of all the courses can be found in our training prospectus.